North America's top two teams take on the best from Asia in what's sure to be one of the most heated tournaments in recent memory. 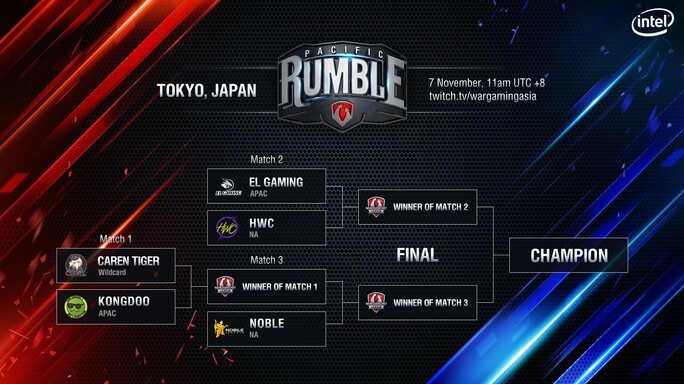 WGLNA Season 1 champions Noble eSports are traveling to Tokyo, Japan for the event alongside Season 1 runners-up High Woltage Caballers, who went on to win the Pacific Rumble qualifier. Do these two calculating, formative squads have enough to take out talented teams like EL Gaming, KongDoo, and wildcard team Caren Tiger? Prize: $100,000 prize pool with $45,000 going to the winner, and $30,000 paid to the runners-up! Format: The games will be played under Season 1's 7/54, Attack/Defense mode. Kicking off the event, there will also be a showcase game between Noble and EL Gaming to preview Season 2's upcoming tier X format. Favorites: Noble has the first round bye and a clear path to the Final. HWC is champing at the bit to prove the WGLNA Finals was a fluke and would love another crack at Noble, but don't overlook EL Gaming, as this team proved to be a tough out at the Global Grand Finals, and could make life difficult for the Caballers. The smart money is on Noble to win it all. Playoff Pick 'em: Think you know how the Pacific Rumble tournament will play out? Pick the order of finish for your shot at winning cool prizes like the AMX 13 57, Premium time, and even a 15% Credit booster. Tanker Trivia: Questions will appear on BattleViewer and Twitter (@WGLNA) during the broadcast. Brush up on the details of this page for your chance to win a T34 Premium heavy tank. Quotes: "I hope to showcase the level of talent in NA and show the other regions that we are able to compete at any level." "We want to put NA on the map, as we’ve been a punching bag for the rest of the world. I think it’s time we punch back, and punch hard."